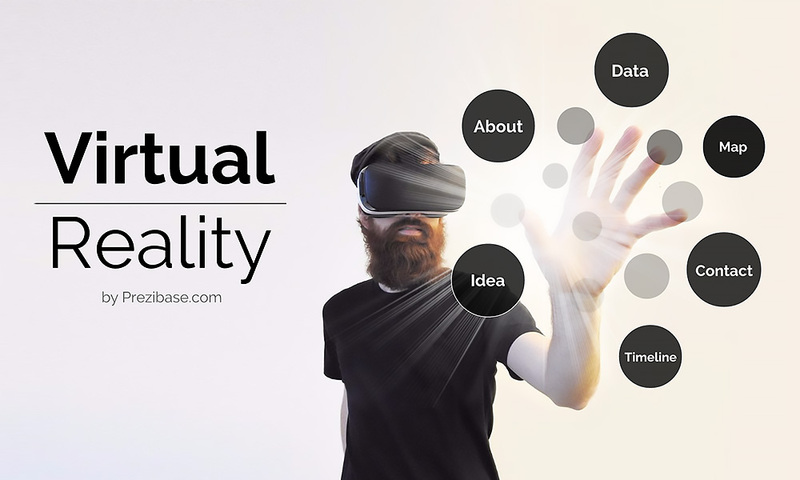 A creative 3D virtual reality Prezi Next presentation template. A man wearing a VR glasses headset, pointing out his hand and a cloud of hovering topic circles in front of him. Talk about the history and future of virtual reality. Compare different technologies and show example content. Great presentation template for introducing virtual reality, augmented reality, 360 videos or interactive media. This entry was posted in Best Prezi presentation templates, Prezi Next Templates and tagged 3d template virtual reality presentation, augmented reality, oculus rift, oculus virtual reality, presentation template virtual reality, prezi next template, prezi next templates, virtual reality presentation template, vr, VR glasses, vr headset.